The Nebraska football coaches have hit the road once again, this time focusing outside of the state of Nebraska. If Coach Mike Riley’s checklist is to be believed, it looks like this week is all about the “coast-to-coast” line on the list. The coaches are clearly excited about the second week on the road, as highlighted by cornerbacks coach Donte Williams. While the coaches can’t technically visit potential prospects during this time (it’s currently an evaluation period, or “quiet period” as it’s also been called), they can visit the schools of prospects and evaluate the athletes during this time. That’s why a lot of the coaches’ tweets center around visits to specific schools. Offensive coordinator Danny Langsdorf made his way to Florida for the week, stopping at IMG Academy to start. 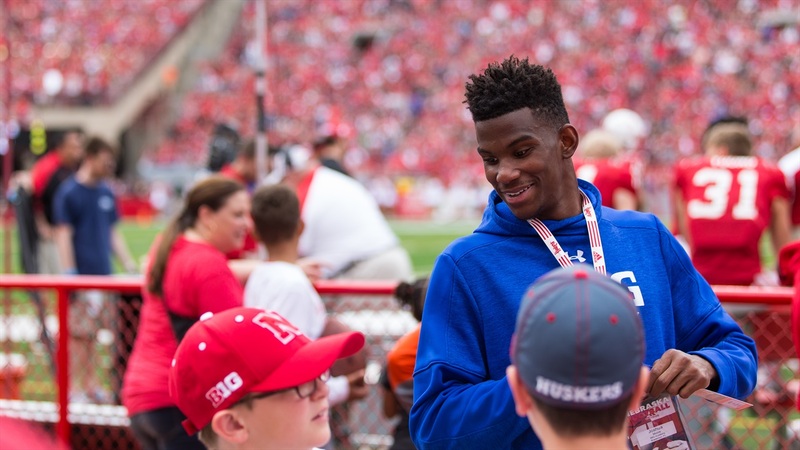 Langsdorf, joined by wide receivers coach Keith Williams (more on that below), saw cornerback Brendan Radley-Hiles, wide receiver Joshua Moore and others during the visit. Nebraska does have quite a few offers out at IMG Academy for both the 2018 class and 2019 class, so this will be a major area of focus over the next few years. Another name to keep an eye on from these visits? Running back T.J. Pledger. While Pledger is already committed to Oklahoma, Radley-Hiles is expected to continue peer-recruiting the running back to Nebraska. Could be interesting to watch this relationship develop before Radley-Hiles graduates from IMG Academy in December. Defensive coordinator Bob Diaco and defensive line coach John Parrella made a stop together in Independence, Missouri, to see 2018 defensive end Daniel Carson. The visit must have left an impression, as Carson’s football coach Matthew Perry tweeted about the visit. In a funny mishap, Perry accidentally tagged lacrosse coach – Coach Perella – in his tweet. Regardless, Diaco and Nebraska’s Parrella were able to see the 3-star in action in an area that could have a lot of impact in the recruiting world. With little room left for defensive ends in the 2018 class, Carson will have to move fast if Nebraska is where he wants to be. Running backs coach Reggie Davis was also on the road this week. He was in Indianapolis, Indiana, likely visiting 4-star running back Markese Stepp. Stepp is already committed to Notre Dame, but he appears to be open to still considering other offers. He retweeted Davis’ tweet, showing that Davis made some kind of impression. As noted above, Williams was in Florida with Langsdorf at the beginning of the week to evaluate Moore. While Langsdorf will stay in Florida, Williams hit the road early Tuesday to make his way to Texas. His expected stop is to see 4-star wide receiver Tommy Bush from Schertz, Texas. Clemens High School is in the midst of its spring practices, which is great timing for Williams to evaluate Bush. Offensive line coach Mike Cavanaugh started his week in Chatham, Illinois, visiting 2019 offensive tackle Will Putnam. The 4-star from Glenwood High School has an impressive offer list so far, including both Ohio State and LSU. Cavanaugh is now headed to Florida to join Langsdorf. We'll have more updates on all the visits across the country in the coming days and weeks. Stay tuned.